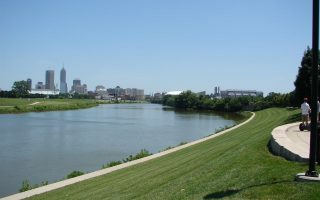 Indianapolis was founded on the White River, which runs along the western edge of downtown and the giant Indianapolis University–Purdue University at Indianapolis campus sits just above the river’s bend. Indy is laid out with four main roadways that extend out diagonally from Monument Circle, city center, and connect cross streets in a grid. 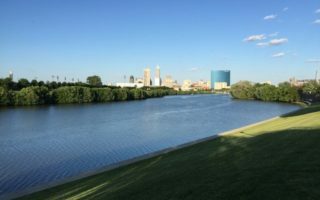 There are some great running options in the downtown area, notably along the White River, the canals, and the unique 8-mile ‘Cultural Trail’. 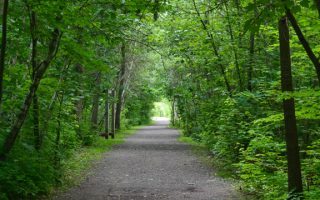 Further afield, there are some wonderful rail trails and parks for running. The downtown area is very walkable, but because Indy is spread out over so many square miles alternate transportation is necessary. IndyGo, Indianapolis Public Transportation Corporation, provides great commuting options, including 30 fixed bus routes throughout the county. 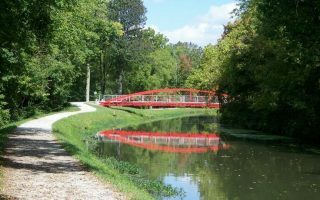 This paved trail makes a winding path through the city from the northeast corner of the county to the southwest, passing many of Indy's cultural and educational attractions. 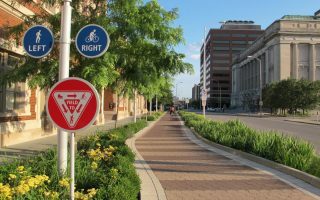 For urban exploration there is not a more connected trail than the Cultural Trail, whose 8 miles makes a loop in and around the urban core of the city. Formerly a military installation, Fort Ben, as it's called, is now a state park and nature preserve. 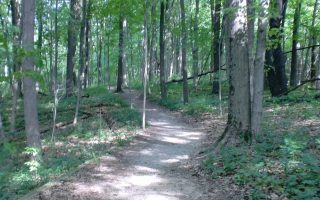 There are several trails to choose from, however, none of the individual trails are more than three miles. One of the best downtown spots to run, no matter the time of day. It's safe, quiet, and uninterrupted by traffic for an almost 2 mile loop. A popular race route, but it is also a great "Heart of the City" run. There are 2 routes: a 3.3 and a 5 mile loop. 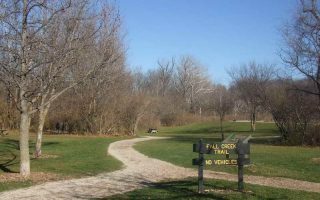 Explore the eastern and southern edges of the city with the Pleasant Run Trail. The south end is at Garfield Park, the north end is Ellenberger Park. 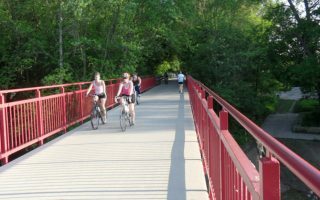 The Monon is the rail trail that started it all. This asphalt path stretches from the town of Westfield in the north, and extends south to the city. This is by far the city’s most popular running spot and one of the largest metropolitan greenspaces in the nation. It includes 5K, 8K, and 10K certified road courses as well as 10 miles of trails. A popular 9.5 mile paved trail that runs along Fall Creek. Starts at 25th & Meridian, and runs north to Skiles Test Nature Park. Summers are typically hot, humid, and wet. 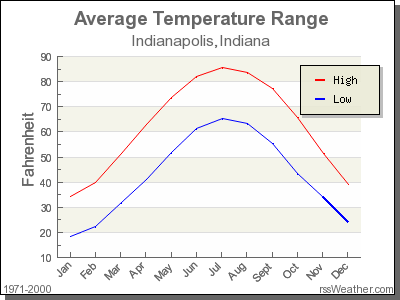 The average temperature in July is 75°F. Winters are generally cold with moderate snowfall, and an average January temperature of 28°F. Spring and Autumn are usually mild, but at times unpredictable, with midday temperature drops exceeding 30°F. The rainiest months occur in the spring and summer. May is typically the wettest, with an average of 5 inches of rain. Severe weather is not uncommon in these months, as the city experiences an average of 20 thunderstorm days annually. 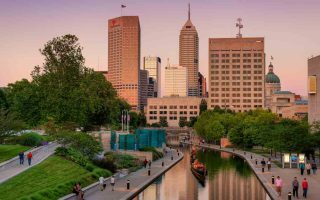 Indy welcomes millions of visitors each year, so hospitality is not something they’re lacking in. The downtown district is an ideal place to stay as it boasts several hotels and is divided into well-marked quadrants that are full of things to do. All areas are within walking distance of downtown hotels and easily accessible via sidewalks with traffic control. Downtown also connects you to a majority of the running routes. Broad Ripple Village, on the city’s north side, is also a good area to stay for those seeking more arts, culture and live music. This is also where you can pick up the Monon Trail and the Cultural Trail. 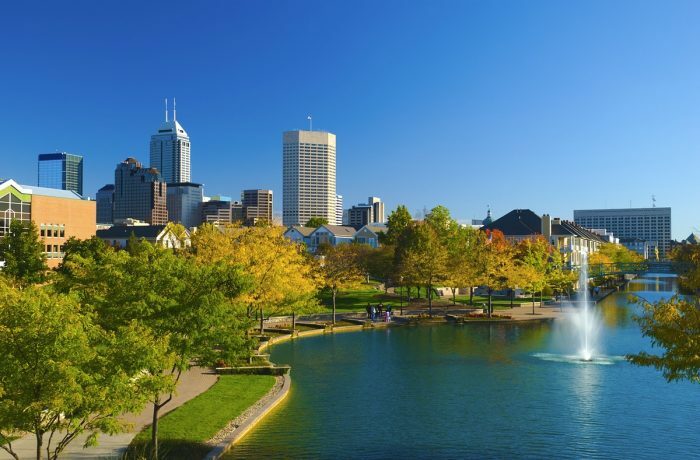 If you’re looking for more budget friendly options, looking towards the southwest side of the city, near the Indianapolis International Airport, is your best bet! The Runners Forum: Whether you are new to running, walking and endurance sports, or looking to take your performance to a new level, the experienced employees at the Runners Forum can answer any question you might have. They also have a program called Good Form Running. It focuses on simple, essential steps that allow for efficient, light, and easy running, along with effective stretching and strengthening techniques. With several locations all over Indianapolis, this is a convenient place to satisfy all your running needs! Blue Mile: Has been in the Indianapolis community 15+ years and is the destination for advice, expertise and encouragement for all runners and walkers. They are a specialty retailer that offers video gait analysis, expert fittings, and specialty product. They are also a part of Running Specialty Group, the parent company of a network of local running stores across the US, with the goal of inspiring, connecting, and serving runners everywhere. Indianapolis Running Calendar, courtesy of Runners Forum. 500 Festival Mini Marathon: “The Mini” is the country’s largest half marathon with 35,000 annual participants. The race is tied to a month-long build up to the Indy 500 at the Indianapolis Motor Speedway. The race course extends from the heart of the city to the famed oval and includes a trek around the legendary track before turning back to the city. 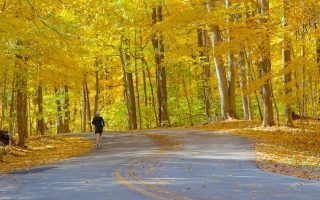 Indianapolis Marathon and Half Marathon: This mid-sized race features the scenic terrain of Fort Harrison State Park on the city’s east side. The race is timed to coincide with peak fall foliage season. The area surrounding the park is hilly by Indy standards so expect some challenges. The race, celebrating 20 years, was named by Runners World magazine as a Top 10 Marathon to do in 2015! Indianapolis Monumental Marathon: Indiana’s largest and fastest growing marathon is among the 100 largest marathons in the world. The race takes over the city each fall and takes participants on a tour of landmarks and historic neighborhoods in the heart of Indianapolis. In addition to the Boston Qualifying Monumental Marathon, there is a half marathon, 5k, and Kids’ Fun Run.